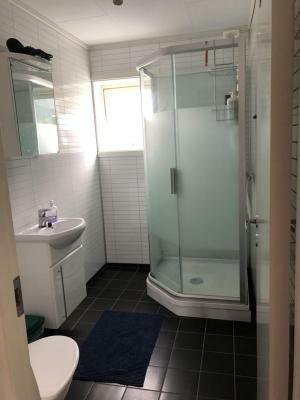 Very good location with scenic views , for winding down from tiring day or getting ready for another day with all amenities and bus/train terminal within short walking distance. Kids had really good time on trampoline. On the upside would be a rather spacious room (double on 3:rd floor), reasonably ok kitchen, decent bed and functional WiFi. 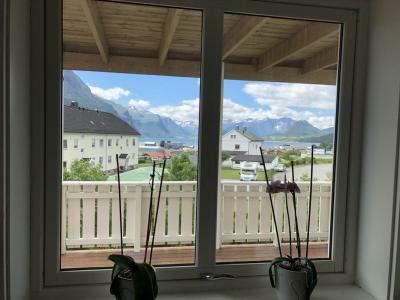 The views from the balcony are of course magnificent (as almost anywhere in Åndalsnes) – but in the winter I would prefer a heated room instead. Not a place I would recommend but of course it works for a few nights. Bedroom was large with balcony and had bathroom and fridge on the same floor. Living room was spacious and includes TV. Helt ok senger . Ellers så ønsker jeg å få etterbetalt noe for oppholdet. Dårlig renhold overalt . Detta är ett renodlat vandrarhem och standarden är där efter. Men för att vara ett vandrarhem var det bra standard. 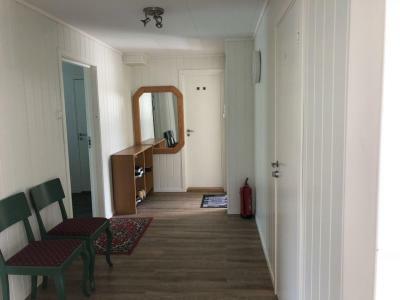 Mycket trevlig ägare som väntade på oss ända tills klockan 2 på natten då vi sent om sider anlände. Mycket lätt att ha att göra med dem. Veldig god seng. God dyne og pute. Nærhet til Romsdalseggen. Ikke problem med å komme utenfor innsjekkingstidspunkt. 생각보다는 깨끗했고, 샤워실 상태도 나쁘진 않았어요. 만약 같은 날 숙박한 사람이 먼저 지저분하게 쓰면 지저분할 수 있겠습니다. 공용화장실이 하나니까요. 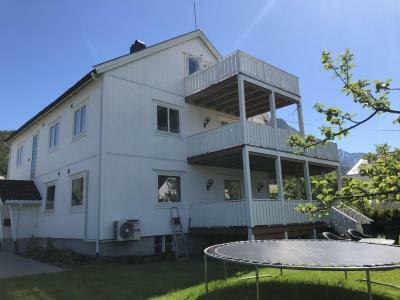 Balkongen och utsikten var bra med boendet. Lugnt område. Tio- femton minuters promenad från tågstationen. 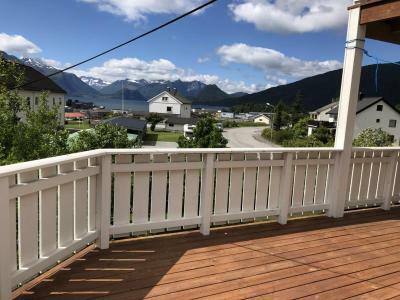 Located a 12-minute walk from Kylling Bridge and Vermafossen waterfall, Åndalsnes gustehouse provides free WiFi. 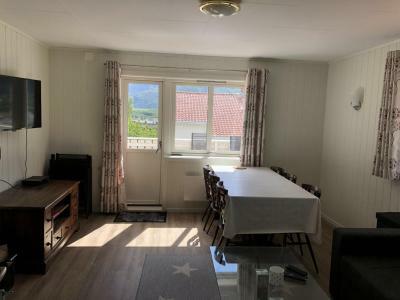 The nearest airport is "Molde, Årø" Airport, 41 miles from the family stay. 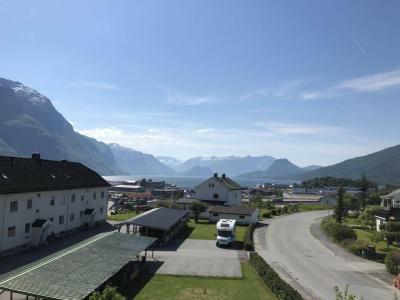 When would you like to stay at Åndalsnes gustehouse? This double room has a balcony, patio and dining area. 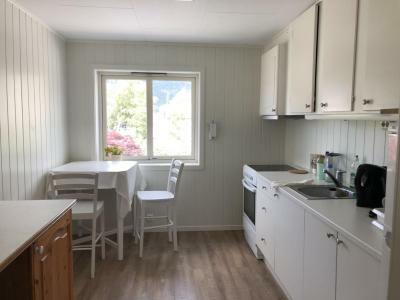 This single room features a balcony, dining area and stovetop. 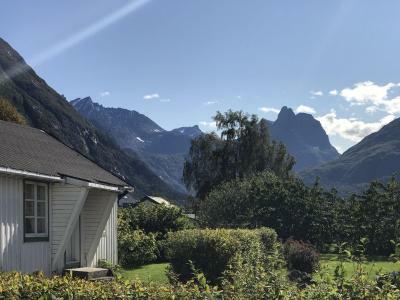 House Rules Åndalsnes gustehouse takes special requests – add in the next step! 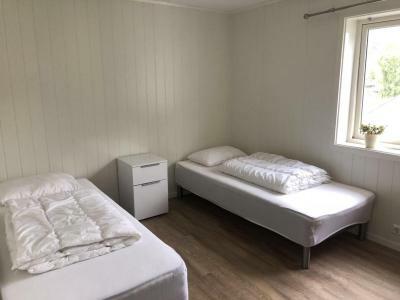 All children under 12 years are charged NOK 150 per night for extra beds. On Google maps you can see there’s a grocery store (Rema 1000) next to the guesthouse - there isn’t, they probably closed it some time ago. It’s not particularly uncomfortable, but it’s good to know in case of planning to do the grocery shopping. The nearest store is about 10-15 min away. No host at the property. When we called him, he spoke little English. No toilet paper in the bathroom, no sheets on the beds, only 1 pillow although I had booked a room for 2. Filthy bathroom and kitchen, shoes were all around the hall/entrance to the property, dirty... At about 8-9pm some friends of the owner came to the living room and were shouting at the top of their lungs while watching a football game. Didn't seem to be willing to lower their voices at all... they just ignored our polite request to calm down a little bit. When we finally packed up our things to leave this... "guesthouse", we discovered that the door had either been locked or it was jammed and couldn't leave. When we called the owner to ask what was wrong with the door, he couldn't really help us. Needless to say that we had to pay for THIS "stay" (of about 1h). I suppose this was the worst and the most unsafe place I've ever stayed at. It's a real shame that booking.com has this place at its website. At arrival the room was chilled out (with the comment “oh, he forgot to plug the heating in) and the only heating source was a fan-heater. So at night I had to choose between being cold or listening to the quite loud noise from the fan-heater. Cleaning also left a lot to wish for – for example cooking-oil on the floor under the table. Chairs almost fell apart when sitting on them and there was no smoke-alarm and no safe way out if there would be a fire in the house/stairwell. Jumping from 3:rd floor should not be the only option. Also, the owners kids ran around in the staircase and made a lot of noise and constantly slammed doors in the early evening. One evening when I got back from dinner (around 8 pm so not late) the front door was locked and my key did not fit! After some time one of the kids heard my but you shouldn’t need to be locked out of your guesthouse! I don't what is wrong with the people living in this house. Everyone is very loud on the stairs and when closing doors... The balcony is not part of the room! It's somewhere else in the stage. Kitchen was good. Very friendly housekeeper. Kitchen was poorly equipped. There were no towels to clean the dishes, and I only found one plate. Didn't find pots to cook with. Bedroom did not have bed sheets and towels could be used at an extra cost. Rooms/stairs are not totally sound proof but then its parquet floor in a house. Kitchen was not well kept esp oven which was very dirty. Short on toiletries also.